This summer, the Pink Singers hosted Hong Kong based choir, Harmonics. 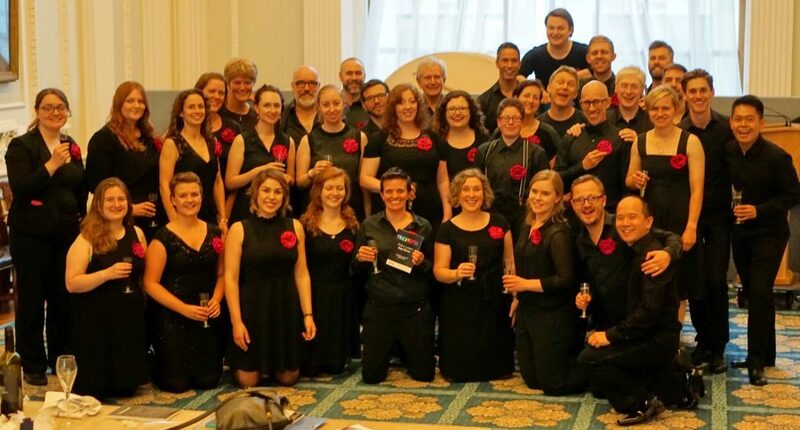 One of its members, Alex, describes the opportunities the global LGBT+ choir community have opened up for him – and how his Pinkie experiences in London and Dublin have made him feel part of the family! August marked the Harmonics choir’s first birthday. 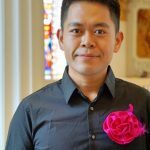 My choir and the LGBT choir culture here in Hong Kong is very young, and of course, I am very new to the choir scene. I am not trained in music and I joined the Harmonics just for fun. Our first gig was a fundraising event for a local charity, AIDS Concern. The song we performed was Truly Brave, a mash-up of Cindi Lauper’s True Colours and Sara Bareilles’ Brave. I had only few rehearsals before the performance as I joined late. Boy, I was so nervous that night! Our music director Matthew Gillespie encouraged us by reminding us that the song had a message and it was up to us to share the importance of being true, heard and seen. I imagined the message being delivered to someone who really needed to hear it in the audience. So I gathered my courage and sang. The message was indeed delivered, and it turned out that the person who needed to hear that message was me. From that night on, I felt that our choir is about more than just singing. 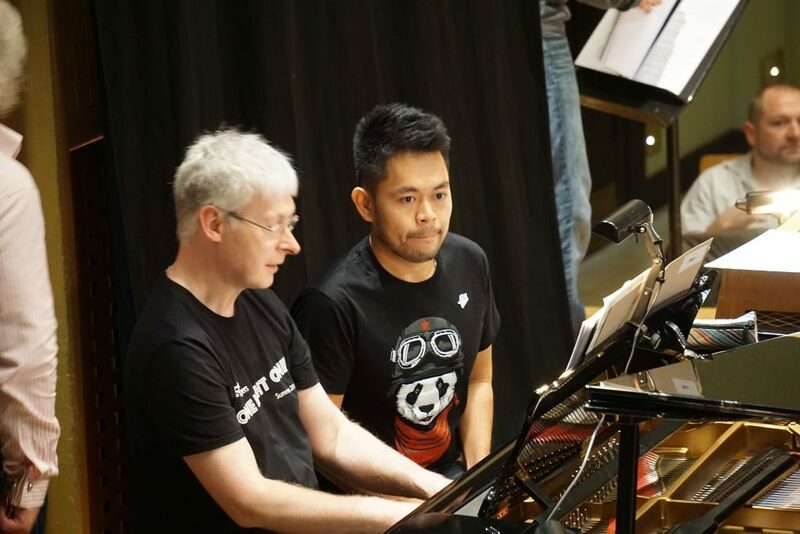 Soon after the gig, I got more involved with the Harmonics and started to manage the choir, but it was not until Hsien from the Pink Singers in London reached out to us on social media, and Richard from the Portland Gay Men’s Chorus visited us, that I realised that there was a huge international LGBT choral community out there. They showed us what we could become. It was exciting to be invited to visit Dublin and London. I had always wanted to see Ireland and had always loved London. I couldn’t wait to finally meet Hsien, a self-proclaimed choir geek with a collection of weird yet fashionable glasses and his short-shorts and heels-wearing, rather handsome, “dance-y” friends from the Barberfellas. I was also excited to say “hello” to the well-dressed, charming theatrical trio from Dublin’s the Homonics, but, I knew that I was on a mission. I was to meet with the choirs and to learn how they were run. It was a lovely evening with the Pinkies. They practiced about a dozen songs and sounded beautiful. John continued to calm and reassure me. Things got a little odd when they sang a song called Hand in Hand. People started to hold hands and some people began to tear up. “Oh my, these people are strange”, I thought. Later I found out that the Pinkies learned the song from the Orlando Gay Chorus 20 years ago. The Pinkies’ thoughts were with those who lost their lives in the recent shooting in Orlando. It was the most emotional rehearsal that I have ever been in. My trip to Dublin was too short to say anything more than that the people were very proud and friendly, and the city gave a genuine vibe. They had the chattiest and friendliest taxi drivers in the world. I would love to go back to see Dublin and Ireland more. I was pretty good at memorising people’s names until the London Gay Men’s Chorus presented me with an impossible challenge. The LGMC is an entirely different beast from the other choirs. With over 200 men, it is raging on testosterone! They are unapologetically powerful when it comes to protest or marching songs and have a ridiculously long waiting list for new singers. It takes three years of waiting time for a baritone like me to join the chorus. This popular choir was featured at the Natural History Museum, one of my favourite places in London, on the historic day when the United Kingdom announced it was to leave the European Union. It was a sad day for many, but the LGMC left me rather positive. They sang Mister Blue Sky facing my favourite exhibit, the iconic Dippy, inside a magnificent building where nature was recorded and homosexuality was celebrated. 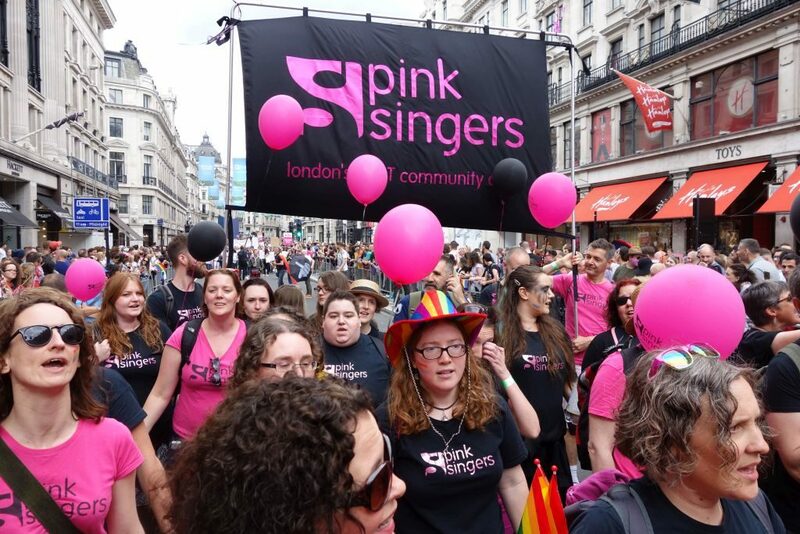 The highlight of my trip was getting to march with the Pink Singers at Pride in London. It was a beautiful sunny day. The Pinkies were in their pink or black t-shirts. Balloons, banners and happy faces painted with rainbows filled our parade. We sang as we marched and the crowd on both sides cheered and sang along, as though we were a group of marathon runners at the finishing line, the difference being that the ovation lasted for almost an hour. It was such an emotional experience and it was the first time I felt publicly celebrated for who I am. All I wished was that my choir could have been there with me to share that moment. I was even given the chance to sing with the Pink Singers on the stage in Trafalgar Square after the march. The song was Together, the theme song of Pride in London this year. It was about being true and about our community spirit, an echo of the experience of the night of my first performance in Hong Kong. Again, I felt nervous about singing after only few practices, but again I was empowered and nurtured. “We are a community choir, so while musicality is important, we just value inclusiveness a bit more”, Hsien once told me. The Pinkies do practice what they preach. In the end, I learned what I anticipated I would learn, and then some. 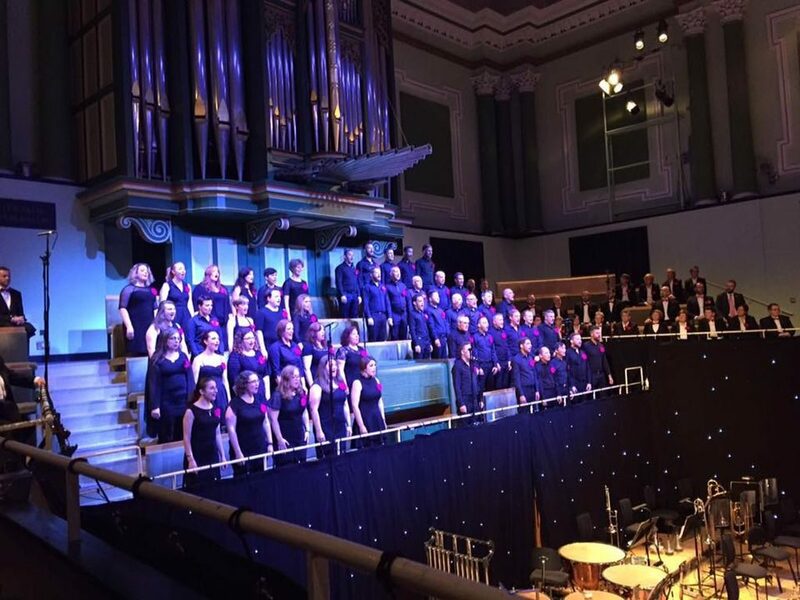 I went from being very eager to become like other established choirs to realising that each choir has its own unique stories and challenges, strengths and charms. I am extremely thankful for what my choir has given me and I am very proud of the community that we build and the passions that we share. Our music director always emphasises how music bridges the gaps. It is so true. Music has brought us all together and now I have a group of friends in Hong Kong, London and Dublin that I call family. Next Next post: Happy Bi Visibility Day!